It was a cold and busy night, so I needed something quick and hearty. Yesterday I saw a recipe on the I Want Crazy Blog for Creamy Tortellini Soup that would have been perfect, if I only had some tortellini.. I had no time to run to the store, so it inspired me to come up with something similar. Here is a quick one-pot meal that can be prepared in 20-25 minutes. First add the chicken broth and pasta sauce. Simmer in a large pot on low-medium heat and blend. Once heated, add the onion, pepper, mushrooms, broccoli and meatballs to the broth. When the broth is very hot and the meatballs are heated through, add the ravioli. The ravioli should cook in about 8-10 minutes. Now mix in your cream cheese to thicken the broth. A few minutes before serving, add in the greens and stir. They will wilt quickly. Top with parmesan, if desired. 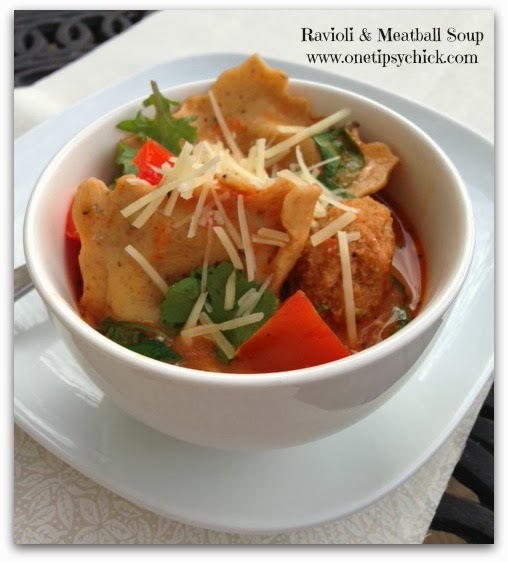 * I always keep extra meatballs or pre-cooked ground turkey in my freezer, to save cooking time on busy days.